Climbing Brown's Mountain is kind of like drinking a shot of espresso: after a pretty short 1.6 mile hike, your trail reward is an explosion of expansive views from a nice little cliff. If you're trying to get a mountain view without leaving the Phoenix metro area, and without the longer (and annoyingly crowded) effort of Piestewa, Camelback or Tom's Thumb, this is your spot. 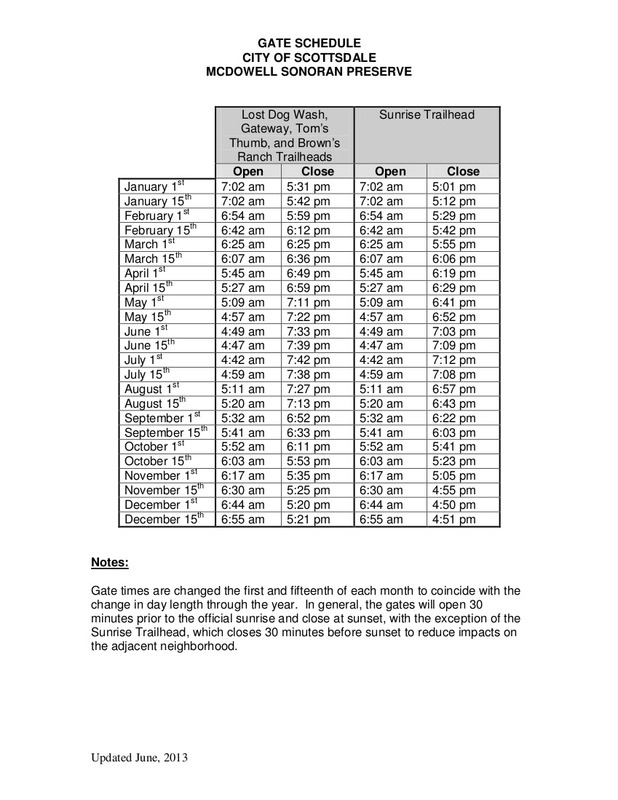 I think the trail names are a little confusing here so here are a few words on that. The trail known as "Brown's Mountain Trail" doesn't start until you've hiked about 0.6 miles on another trail, called Brown's Ranch Road. 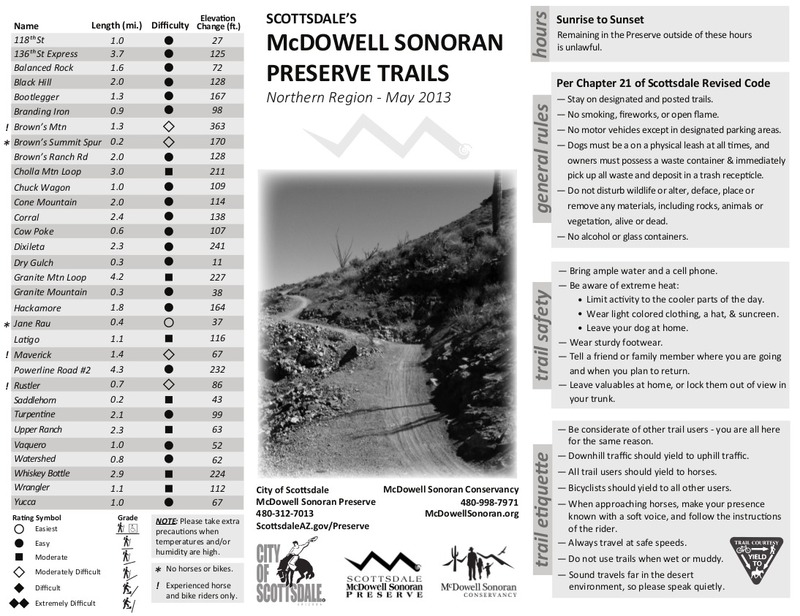 Study the official McDowell-Sonoran Preserve map if you're at all confused. 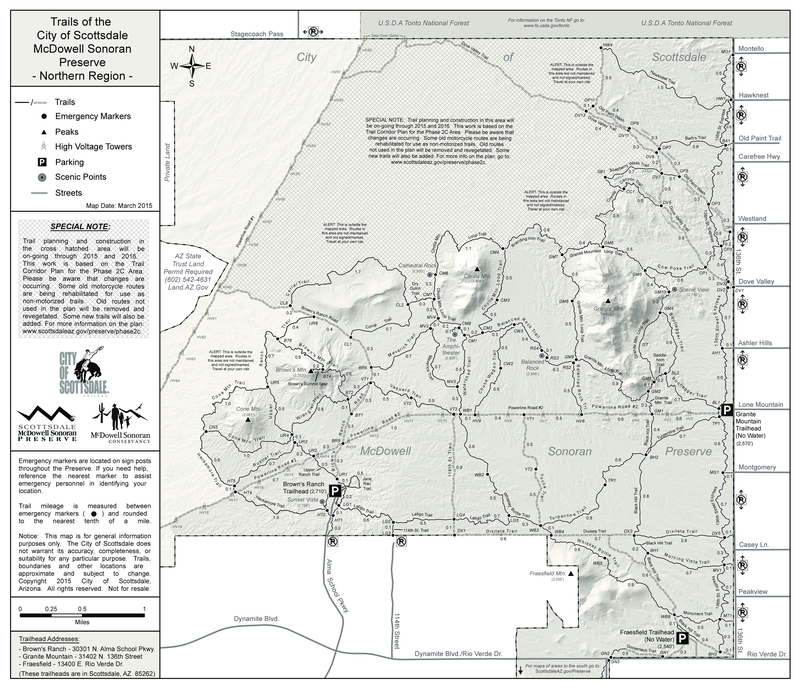 If you don't take the required left turn at 0.6 miles, you will continue onto Brown's Ranch Road and do a partial circumference of the mountain. I don't know why MSP decided to call this a "road" but it is definitely a trail. 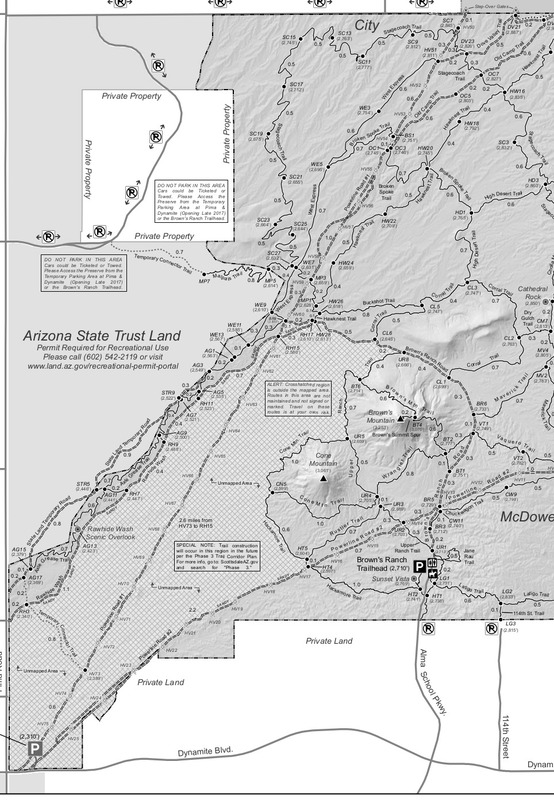 The trail to the summit starts at the clearly-marked and paved Brown's Ranch Trailhead. For about 0.6 miles you will walk down the flat and easy "Brown's Ranch Road" trail. This northern section of the MSP is popular with mountain bikers so you'll be passed by plenty of them on this stretch. This is a popular walking trail for area residents so expect some crowds in nice weather. At 0.6 miles, there's an official sign pointing you to your left to reach the summit of Brown's Mountain. This is where Brown's Mountain Trail actually begins. What's fun about this mountain is that, both from the trailhead and from this 0.6 mile marker, you can look up and directly see your objective. The cliff-like summit might look daunting to a novice hiker or someone not in great shape. But this is one of the easiest mountain climbs in the metro area. For another 0.7 miles, you gradually make a few easy switchbacks up the mountainside. After that 0.7 miles, there's a sign giving you two options: to your right is a scenic overlook, and to the left is the summit. If you're not up for the 0.2 mile scramble to the summit but still want a nice view, the overlook is lovely and a good place for photos. The summit trail to the left features some loose footing, so hike it with care. My wife has a physiological fear of heights (dizziness, loss of balance), so she needed some hand-holding and cheerleading to make it up, but she was successful and can't wait to do it again. This summit if you reach it is one of my favorites in town, despite the ease of reaching it. Be careful near the cliff edges. The 360 views are expansive. On a clear day you can see the Four Peaks and Battleship Mountain in the Superstitions, Camelback Mountain, Piestewa Peak, the South Mountain range, and many others. You can also see the parking lot that you walked in from. The views of the Preserve itself are also delicious. Brown's Ranch was an active ranch for decades, and most of the ranch buildings were at the foot of this mountain. In 1959, a bunch of ranch hands evidently scrambled up this mountain to lay some foundation for a structure, and carved their names into a small concrete pad at the top. You'll know the year because one of them carved "1959" next to his name. 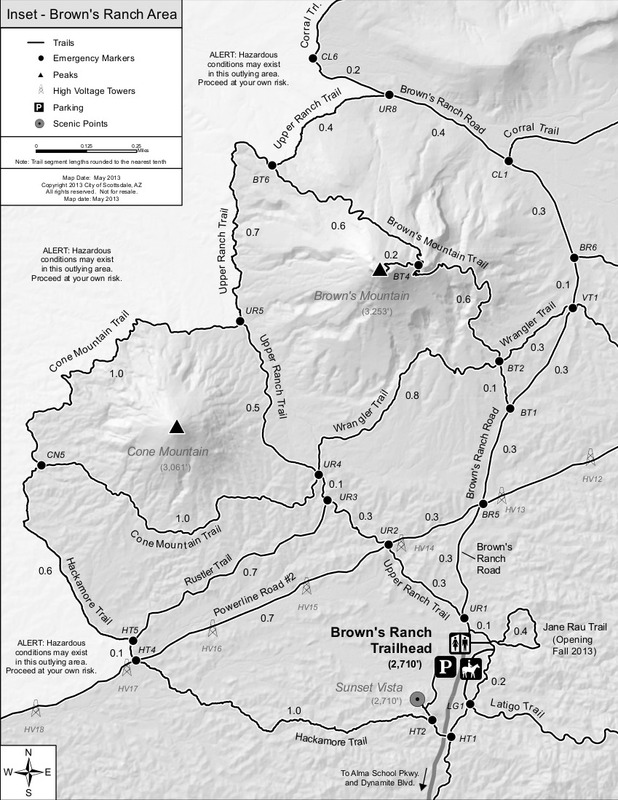 If you skip the summit trail altogether or want to continue on Brown's Mountain Trail, you can continue on until connecting with the Upper Ranch Trail. Water fountains for both humans and dogs are at the trailhead.